Once the “IOW Transport Infrastructure Taskforce” had been finally set up in July 2016, PRO-LINK were invited to meet with them on the 23rd Sept 2016. During that meeting, the statement spreadsheet below was submitted within the complete submitted statement, asking for a recommendation to the DfT for an independently carried out, IOW Fixed Link Study. PRO-LINK believes the case made is too compelling to resist. 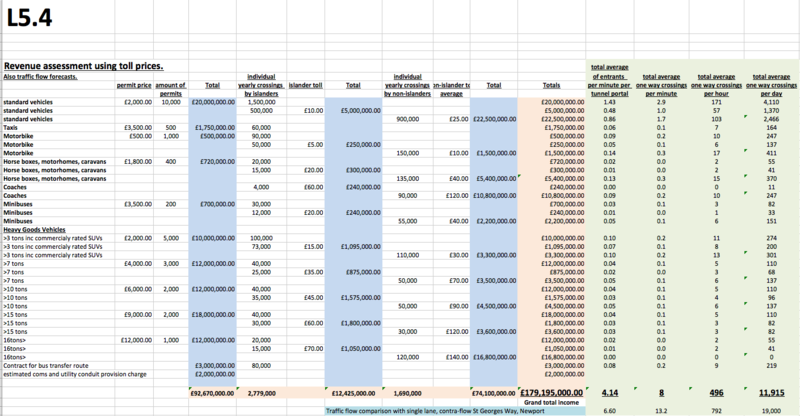 The spreadsheet below gives an indicative assessment of potential toll incomes and traffic flow. A guide to potential Fixed Link income. Proposed route: Whippingham area (IOW) to inland of Lee-on-Solent area (mainland). Tunnel construction to be approx. four miles of twin bored, dual carriageway to span the Solent from Whippingham to the Lee-on-Solent area. Utilities and communications will have conduits through the tunnel. Charges to the relevant companies will be made for this provision.Expert assessment for these individual charges is required. Transfer buses via the Southern Vectis island bus company. Yearly contract to transfer passengers through the tunnel from island towns to selected mainland routes. Island public transport and rural location services will be revitalised, at that time theoretically using electrically powered vehicles. £3million. London congestion charge. It will be encouraged to use this mode of payment to enable fluid traffic management. A separate booth for cash sales will incur increased toll payments by 10%. In all cases, annual permits will be offered to only to genuine island residents and island businesses to allow the exit of vehicles from the island more often. Application criteria will be required. Standard commuter 12 month permit to travel at will with a standard vehicle that is nominated, any time of the year, any time of the day, for up to 2 return journeys per day. £2,000 p/a. Up to 3 tons inc’ commercially rated SUVs £2000 or £30 each way. Individual islander crossings for Island residents with a nominated Island registered standard vehicle. (Without a permit) £10 each way all year. Individual non-islander crossings for standard vehicles not registered on the Island cannot have permits (to limit traffic on to the island). £20 each way low season. £30 each way high season. Horseboxes, motorhomes, caravans, and minibuses. £40 each way. Island registered vehicles will receive 50% discounts on these tolls. Coaches will not be able to gain islander permits. This is to prevent unfair competition to the contract holder for island/ mainland transfer buses. Low season £90 each way. High season and Bestival (Sept) £150 each way. Island based businesses island registered coaches will attract a 50% discount to these rates. availability especially at weekends to the detriment of business. The tolls are cheaper than the ferries and offer no restricted freedom of movement which will build the economy and improved lifestyle. General running costs of an automated toll Tunnel are small once build is completed, especially when compared to ferry businesses. £5million per year is an estimation but more expert analysis will be required depending on final structure. We believe Government favour these types of projects. Many people employed to design and build the link who pay tax, many materials used (vat), tolls with minimal overheads and a booming Island economy with private investment and uplift in wages, that has less unemployment, more businesses and tourists spending money. A portion of the tolls could be used to improve Island Infrastructure, roads, clean beaches, cut grass verges, etc. which will ease the local council responsibilities. Just Wightlink employs 600-750 staff (£10-£12million per annum in wages alone). Add fuel, depreciation, maintenance, pensions, regulatory coding, etc.…. very inefficient. A Fixed Link has very few overheads as registration plate recognition technology is mainly used which is combined with credit/ debit card pre-registration, similar to the London Congestion charge. This allows far cheaper tolls in comparison to ferry fares while still making an excellent and attractive yield for private investors and Government. These estimations are averaged over the year (summer, Bestival, festival, winter). Last year roughly 2.1 million vehicles travelled on the ferries of which 275,000 were HGVs. We anticipate an uplift in vehicular traffic as people get used to their freedom to travel to and from the mainland at any hour of the day. The Yarmouth-Lymington ferry should stay so that may offset the uplift slightly. It is envisaged the tunnel company would seek to amalgamate the West Wight ferry and the East Wight Tunnel in to the same business. The present average daily crossing volume is approximately 5,700 vehicles. These numbers are set to at least double or triple once economy of tolls and ease of access is established. These figures have included an approximate two fold increase in usage from the present day which is 11,700 vehicular crossings over a 24 hour period as opposed to a total of 5 hours of surges each day associated with the ferry option. For a comparison of traffic flow, St Georges Way in Newport is a single contraflow road with an average of 19,000 vehicular movements per day. The toll prices quoted are 50% to 90% cheaper than the present day ferry fares.